The famous chocolate peanut butter healthy no bake cookies made with better-for-you ingredients (no refined sugars). These easy healthy no bake cookies can be made in 15 minutes or less and are truly the best! 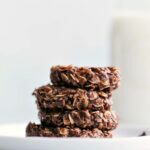 If you’re not a chocolate fan or are looking for something new to try, I have other flavors of delicious healthy no bake cookies including my easy no bake breakfast cookies, no bake cinnamon roll cookies, and healthy no bake tropical cookies. 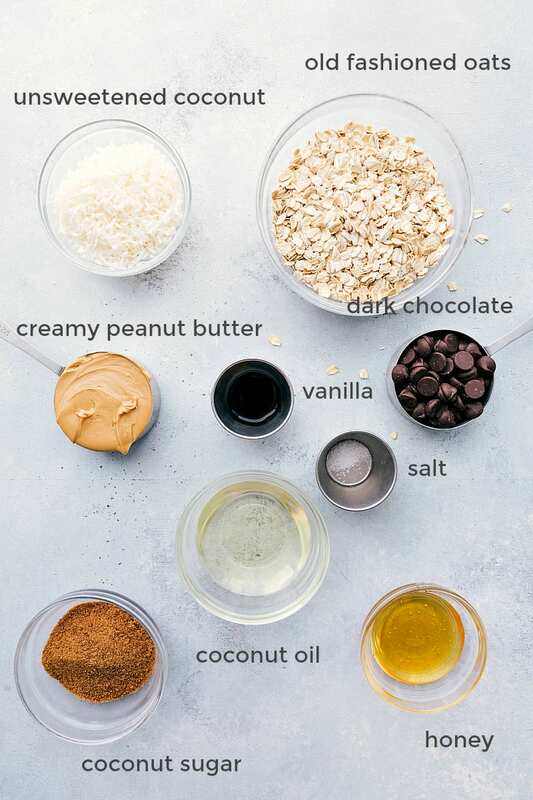 Peanut butter – if you have an allergy or just aren’t a peanut fan, you can make these healthy no bake cookies without peanut butter by replacing the peanut butter with almond butter or another nut/seed butter of your choice. 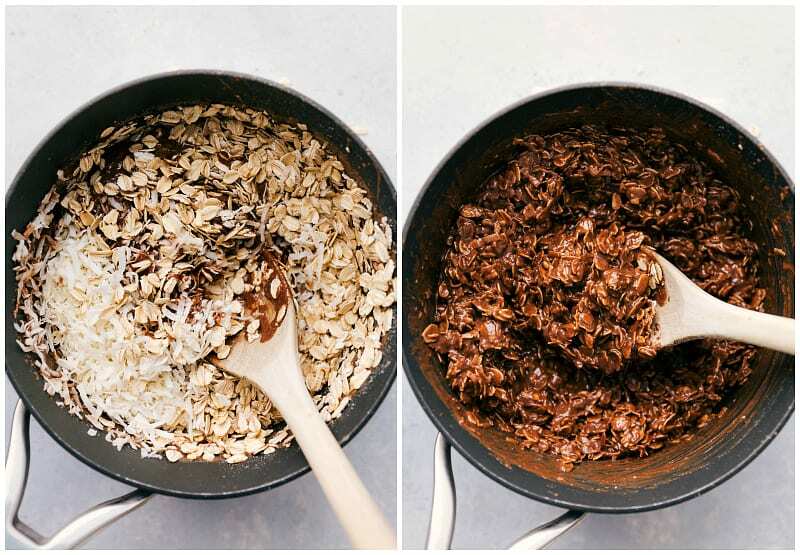 Coconut – for less of a coconut flavor, make these healthy no bake oatmeal cookies by replacing the shredded coconut with an equal amount of oats. 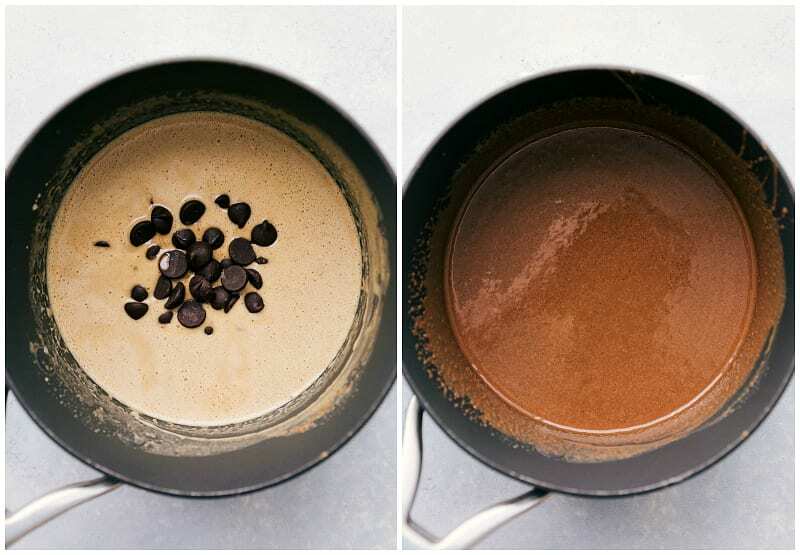 Chocolate – the darker the chocolate is, the healthier it is. However, if you aren’t a dark chocolate fan and don’t mind the cookies being less healthy, you can replace the dark chocolate with milk chocolate. Can you use old fashioned oats in no bake cookies? Yes! 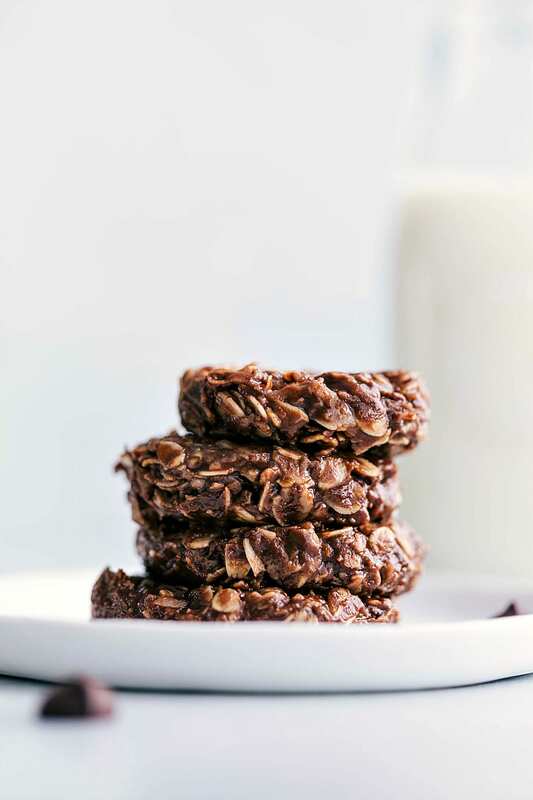 For the very best texture, old fashioned oats are the preferred oat to use in these healthy no bake cookies. 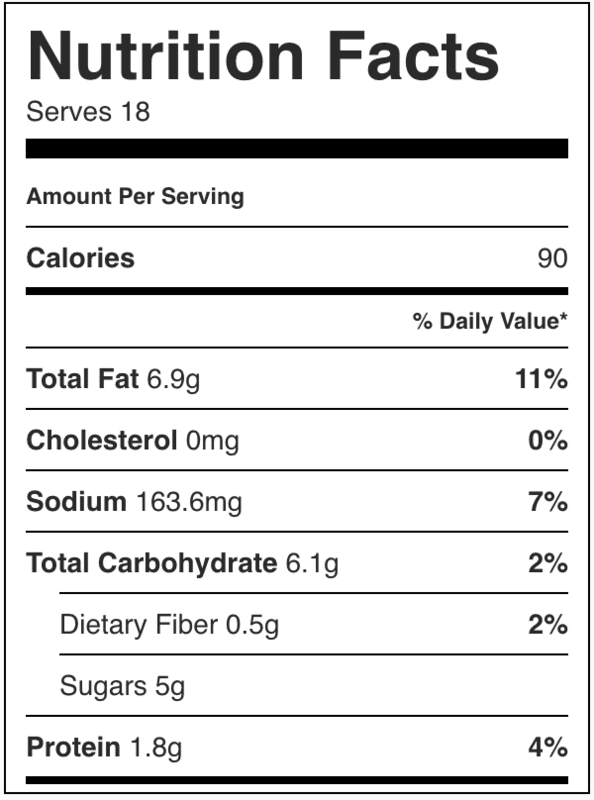 What can I substitute for butter in no bake cookies? These healthy no bake cookies don’t have any butter! Coconut oil works perfectly in the place of butter — it’s a healthier fat and it melts and then hardens similar to butter. How do I store these Healthy No Bake Cookies? These cookies store well in an airtight container for up to a week. While they are fine to be left out at room temperature, these cookies are best straight out of the fridge. I do recommend storing them in the fridge for optimal texture and freshness. Can I freeze these Healthy No Bake Cookies? These no bake cookies can take up to an hour to set up. If you don’t want to wait, you can pop them in the freezer for 15 minutes and they’ll be ready to go! You can also store these no bake cookies in the freezer in an airtight for up to two months. How do you make healthy oatmeal cookies? For a standard healthy oatmeal cookie, try these! For these healthy no bake cookies, you’ll start by combining the peanut butter and coconut oil in a small pot over medium heat. 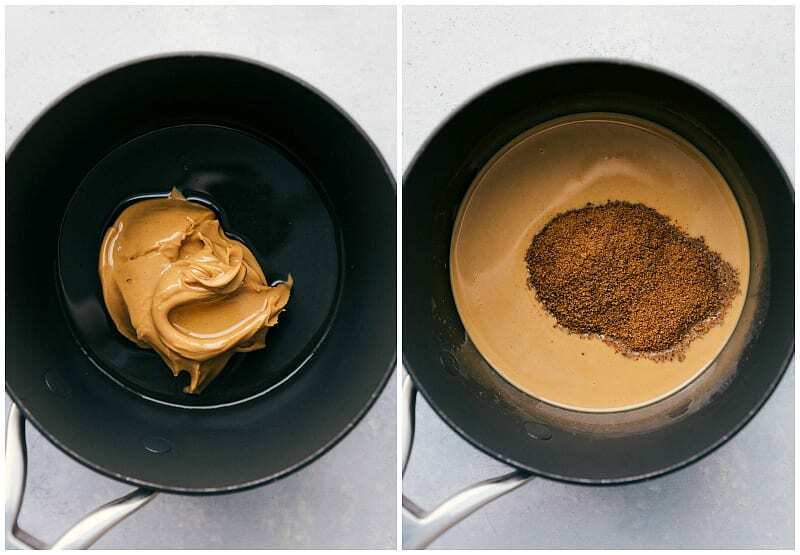 Once smooth, add in the coconut sugar and stir until the sugar is dissolved. Using a cookie scoop, scoop out and tightly compress the mixture. These scoops go into a miniature muffin tin and are placed in the fridge (or freezer) to harden. Once the cookies are hard, you can press them down into more of a cookie shape. The famous chocolate + peanut butter no bake cookies made with better-for-you ingredients. These easy healthy no bake cookies can be made in 15 minutes! Line 12 cavities in a miniature muffin tin with paper liners and set aside. Remove from heat and add in the chocolate chips and stir constantly until all the chocolate is melted. Add in the vanilla and salt. Stir in the honey. Stir in the coconut and old fashioned oats. Use a cookie scoop to scoop out and tightly compress the mixture into cookies. If you don't have a cookie scoop these don't hold too well with your hands so try to use two spoons to form balls. These are best stored in an airtight container in the fridge but they can be left at room temperature. *Dark chocolate is a healthier chocolate. If you hate dark chocolate and don't mind a less healthy treat, use milk chocolate. ooo i used to love making no bake cookies as a kid growing up. i could eat them (almost) right away haha and not get in trouble for eating the dough. love how simple this recipe is, saving for later! That was the best part about making them! 🙂 Thank you so much Beverley!! Wow! These look amazing! Is it bad that I am craving them at 7:30 in the morning? Breakfast cookie perhaps? I will definitely be trying these soon. Amazing Chelsea! Haha sounds like every one of my mornings! 😉 Thanks so much Jackie! omg HOW CUTE is Grey! I can’t believe he’s talking so much! and OF COURSE he loved these cookies-they look so insanely delicious no one could resist! These look amazing, I can’t eat nuts though, any suggestions for alternatives please? You kid sounds adorabe btw! Awe thank you! 🙂 I haven’t tried anything other than the peanut or almond butter, but I bet sunbutter would work as it’s a pretty close substitute! I was wondering if u could substitute dark cocoa powder for the chocolate chips and if so how much. I wouldn’t recommend the substitute. Also without further testing I’m unsure how much to recommend. Sorry, wish I could be of more help!